These pancakes are not lookers. I wasn't even sure I should introduce them to you, in fact, and I certainly have no intention of showing you the batter. That would send you running for sure. But they are tasty, and better yet, they're kind of healthy, too. They're made with cornmeal, rather than all flour—hence the thinness, and the funny yellow look. I don't mean to make them sound so bad. They do frill out sort of nicely around the edges, and even though they're thin, they're not at all difficult to handle in the pan. They're actually more like a cross between a pancake and a crepe, except without all the ruined batches and fuss. I found them in the Joy of Cooking—you'd be surprised how many odd pancake recipes they have. I'd already tried the four grain flapjacks, and buttermilk just seemed too plain Jane for all of you. Not to mention, cornmeal is one of the few grains produced locally, a big, big plus. The recipe was simple. It didn't call for anything really wacky, just eggs and butter and cornmeal and flour and sugar and milk, with a bit of baking powder and salt thrown in. And despite the less-than-stunning batter, the finished product was very good at soaking up syrup and butter, which is always a plus in my book. Which brings me to today's local food report—it's on the sweet stuff. Apparently, not all maple syrup comes from bushy red trees in Vermont. You can tap trees around here—swamp maples, that is. Most books say it's impossible, but a couple in Dartmouth has been doing it for years. They say the syrup is more vanilla-y, and sweeter, but that otherwise the process is pretty much the same. They tap the trees just as you would a sugar maple, and boil down the sap in a ratio of about forty gallons of raw juice to a single gallon of syrup. It's a lot of work, between the tapping and collecting and the simmering, but they say it's worth it. Just in case you might have a swamp maple outside, you can go here to find out how to identify it, or here, or even here. It might be worth a try, particularly if you plan to keep making the cornmeal pancakes above. They go very, very well with syrup, and vanilla-y syrup in particular I think. Preheat griddle or large casting iron frying pan. In a large bowl, mix cornmeal, flour, baking powder, and salt. In a separate bowl, mix the milk, whatever sweetener you choose, the butter, and the eggs. Pour the wet ingredients into the dry, and mix the whole shebang up. Grease the griddle and pour batter on about 1/4 cup at a time. 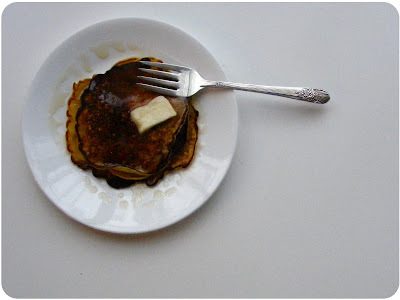 Keep cooking until you have a nice stack of pancakes, then sit down with maple syrup and butter and enjoy! Is there anywhere on Cape you can buy swamp maple syrup? Unfortunately no, not that I'm aware of. I think it's one of those foods that a do-it-yourself treat! I'll let you know if I hear anything, though. We live in Maine, where sugar maples abound -- but not on our property. Several years ago (well before that little girl Elspeth was born), we tapped the red maples (a different species than swamp maple) right outside our door and made syrup. It was delicious. The only hitch was that red maples produce even less syrup per unit of sap than sugar maples do, so it was a LOT of work to get the finished product. It can be done, however. And looking at the price of maple syrup these days ($20/quart in Maine now), I might start doing it again!